Today I wanted to give you a few Quick and Easy Organization Ideas. 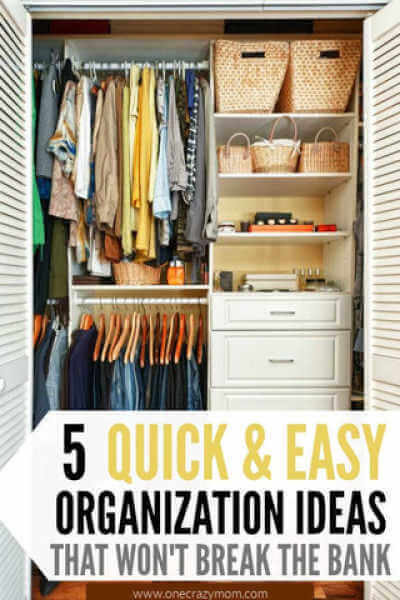 Learn where and how to start with these 5 home organization ideas that make getting things in order so easy! It can be a struggle to get the clutter under control. Let’s go into the new year with a plan and tackle all of our stuff! First, it can be overwhelming – you know you have to start somewhere, but where? Second, it can get costly – organization experts have lots of great ideas, but spending a small fortune to execute them isn’t really helpful. What I find is that when I have a plan and some simple (and inexpensive) ways to get started, the project of organizing becomes much less overwhelming. Let’s get started with these home organization ideas! Your home will be in great shape in no time at all. Start with these tips to get everything in order and bring peace back into your home. Everyone will feel better and mornings will be easier when everything is organized. 1. Binders and colored tabs dividers. If you’re like me, you are overwhelmed by paper. School papers, medical bills and claims, billing statements, etc. Make binders and colored tab dividers your best friends. I like to get binders at Walmart because while they are a little more expensive than what I find at the dollar store, they are sturdier and there is more variety. Get the big binders – 2.5 or 3 inches – and pick up one for each person in your family plus two more (for utilities and other items not related to a specific family member). Use the colored tab dividers however you see fit (school info, doctor, bills and claims, etc. are good headers for the kids’ binders), and start to sort. When the papers first come home, try to get them in the binders right away! I have learned if you do it as soon as it comes home, it makes for less mess. If you put it off a day that turns into a week and months later, you have paper piles all over. You get the idea. 2. Small plastic bins solve almost all problems. My kids love art, and we have art supplies all over the place! I picked up inexpensive small bins with lids for crayons, markers, colored pencils, and stickers. They are small, easy to stack, and mess-free. We pull out one bin when they want to use crayons, put the crayons back when we’re done, and move on to the next activity. But don’t stop at art supplies. I use these bins in my pantry, my medicine cabinets, my laundry room, the kids closets, and even my office! Think outside the box with this easy organizational tool. They are great for nail polish in the bathroom or other small items to keep counters clutter free. These fabric baskets are a life-saver for me! I have fabric baskets in my linen closet, the kids’ rooms, and the family room – they come in so many colors and sizes that they can suit any need. I categorize each basket so that it’s simple to know what goes in them. In the linen closet, for example, I have separate bins for toiletries, nail polish, extras (new bottles of shampoo, conditioner, lotion, etc. ), tooth brushing (new toothbrushes and floss from dental visits go here), and medical (band-aids, rubbing alcohol, etc.). Since each basket has a category, there is no excuse for my kids leaving things on the counter! This is probably my favorite tool of all of my Quick and Easy Organization Ideas. You could even use a cardboard box and cover with pretty fabric and put in the linen closet or wherever you need it. My kitchen drawers were a wasteland until I decided to get drawer organizers. It made a big difference in my serving utensil drawers and “junk” drawer (these interlocking ones are great because you can customize them for your drawer). I actually have both of them throughout my house and I love them. Don’t just think kitchen and junk drawer. Also use them in the bathrooms for a much more organized home. 5. Go vertical in the garage. For a lot of people, the garage is an organizational nightmare. You have lots of untapped wall space in a garage, and making good use of it will help! 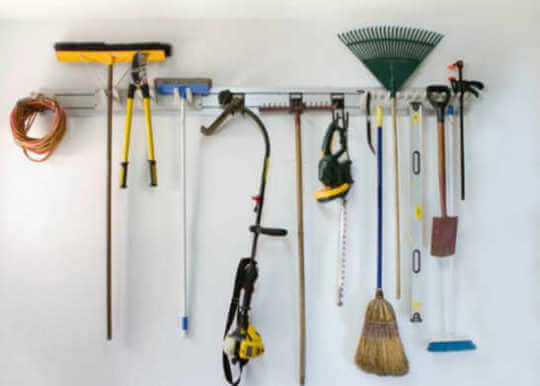 Home improvement stores like Home Depot and Lowe’s have hooks for yard tools, ladders, and even bikes! They are inexpensive, simple to install, and you’ll be able to free up garage floor space in no time. Getting organized shouldn’t break the bank if you do it right. You can find lots of great storage systems on Amazon for garage tools. 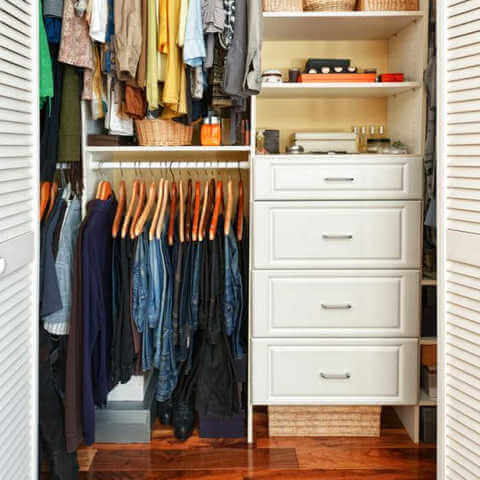 Follow these simple and easy organization ideas to get your home more organized! You will be amazed at how easy it will be to stay organized once you do the initial work! Plus, it does not have to be expensive if you utilize these frugal ideas. Choose one of these organization ideas to start with and just tackle them one by one. Don’t try to do it all at once or you will get overwhelmed. Whether you start with your spice rack, your living room or laundry room, these organizing tips will have you well on your way to an organized home. Some of my favorite ideas include a storage solution that consists of DIY projects or using something you already have. Home organization does not have to bust the budget. You will be amazed at just what a simple command hook can do to your laundry room. Think outside the box and get started! Make a list of where you want to start and go from there. It is worth repeating that you do not need to tackle the entire house in one afternoon. It is likely you will get frustrated and give up. We don’t want this so tackle the house in bite size pieces. Whether you have home goals or personal goals, it is always best to tackle them in smaller sections. You will feel so good when you accomplish it and feel encouraged to move on to the next goal. Do you have any organization ideas to add? We are always looking for new and creative ways to keep things organized around here. Please leave us a comment with any ideas you would like to share. We are all going to have organizes home. I’m confident we can all do this if we are intentional with our time and resources! We have the perfect solution to get your home organized with these Dollar Store Home Organization Ideas. We have 10 creative ways to organize your freezer. Give these easy and frugal freezer organizer ideas a try. How to clean stove top in one easy step!